On Friday afternoon, three friends and I went to PS1, the annex of the MoMA in Queens that exhibits contemporary art. 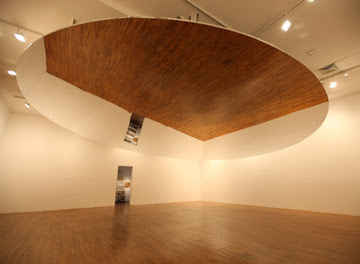 Perhaps the place where we spent the most time was under this large rotating mirror pictured above, an installation piece by Olafur Eliasson intended to change the participators' perception of self and challenge basic perception itself. One spends so much time staring at their reflection and the reflection of others in only the mirror that sitting up to realize these people are actually laying next to one's body creates a dizzying, disorienting experience. I'd say that we spent about a half hour under this mirror. He would gaze at himself until there were two selves facing one another, neither of which could claim to be the real one. The sensation was of being disembodied. He was no longer anything exact as a person. He had the dizzying feeling of separating himself so deeply in this process that he would be unable to come out of it even though his mind was lucid. He would have to rely on some outside stimulus, a loud noise or a change in the light coming in the window, to capture his attention and make him whole again. I thought that was pretty cool, especially since this book is sort of a defining work of postmodernism and has several metaphors for the concept of postmodernity. The end of the chapter goes on to explain how this character, named only as "the boy", goes ice skating and follows with his eyes the tracks made in the ice, tracks that are then erased by other skates, remembered only as moments of the past. Cool that you referenced Ragtime in this entry. I read it when I was in college and didn't realize (at the time) that is was a seminal work. This mirror installation reminds me of one of the exhibits at the Tate Modern in London...the entire ceiling of a factory loading dock was covered with mirrors, and the space was filled with fog. It was insane to lay on the floor and look up at the wavering reflections of yourself with a hundred other people.